Of Interest: The wide-angle camera (WAC) is not a typical color camera. It can image in 11 colors, ranging from 430 to 1020 nm wavelength (visible through near-infrared). It does this with a filter wheel: the 11 narrow-band filters (plus one clear filter) are mounted onto a wheel that can be rotated to allow the camera to capture an image through each filter. In this image the 1000 nm, 750 nm, and 430 nm filters are displayed in red, green, and blue, respectively. 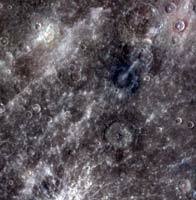 Several craters appear to have excavated compositionally distinct low-reflectance (brown-blue in this color scheme) material, and the bright rays of Hokusai crater to the north cross the image. During MESSENGER�s orbital operations, we will typically use just eight of the WAC's filters. This decision was made to reduce the amount of data that must be stored on the spacecraft�s solid-state recorder before the information can be downlinked. It�s also quicker than cycling through all 11 filters — the spacecraft is moving rapidly over the surface, and there isn't much time to image the same spot on the surface 11 times over before moving to the next area of interest. The sets of color images will help us learn about the variation in composition from place to place on the planet. For example, some minerals such as olivine and pyroxene often absorb more light at longer wavelengths than at shorter ones, so we�ll be looking for their signatures in the reflectance spectra derived from each eight-color set. WAC images will be used in coordination with the Mercury Atmospheric and Surface Composition Spectrometer (MASCS), a hyperspectral instrument that provides reflectance information at many more wavelengths, but only for one spot on the surface at a time.